recycled fabrics – Unique Hand-made Patchwork DRESSES JACKETS SKIRTS KIMONOS. Unique Hand-made Patchwork DRESSES JACKETS SKIRTS KIMONOS. A new fashion paradigm being experienced by designers, businesses and consumers is one by which clothes are treasured and valued for a variety of reasons based on overall sustainable production. This contrasts greatly with the existing buy-today, throw-away-tomorrow fashion business model. Why the growth in up-cycling? 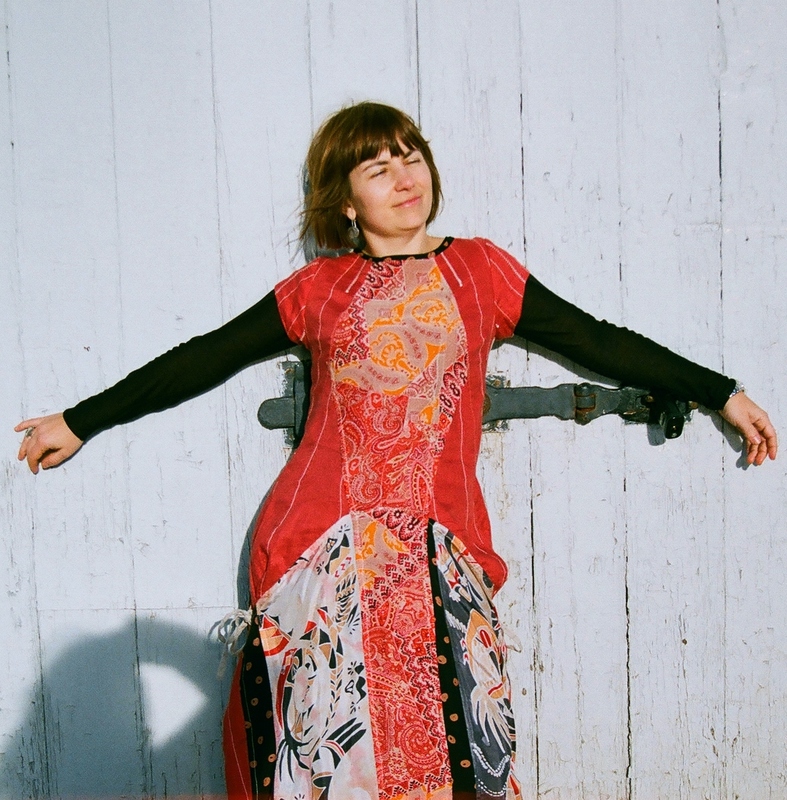 The slow fashion CONSUMER is happy to spend more on garments which are sustainably produced. The slow fashion DESIGNER or maker is happy to take longer on manufacture. The constant waste of materials, with their associated production costs, is both an environmental and health dilemma. If you value the raw materials, of sustainable, ecological origins, you may value your garment more highly, and wear it for many years with a focus more on your clothes being timeless. (witness the popularity of ‘vintage’). These days there is a proliferation of cast away clothes, a wasteful situation caused by fast fashion trends and cheapness of garments. Charity shops are brimming with last season’s clothes. Textile recycling and disposing companies are selling old clothes to Africa, impacting indigenous economies by reducing artisan production. 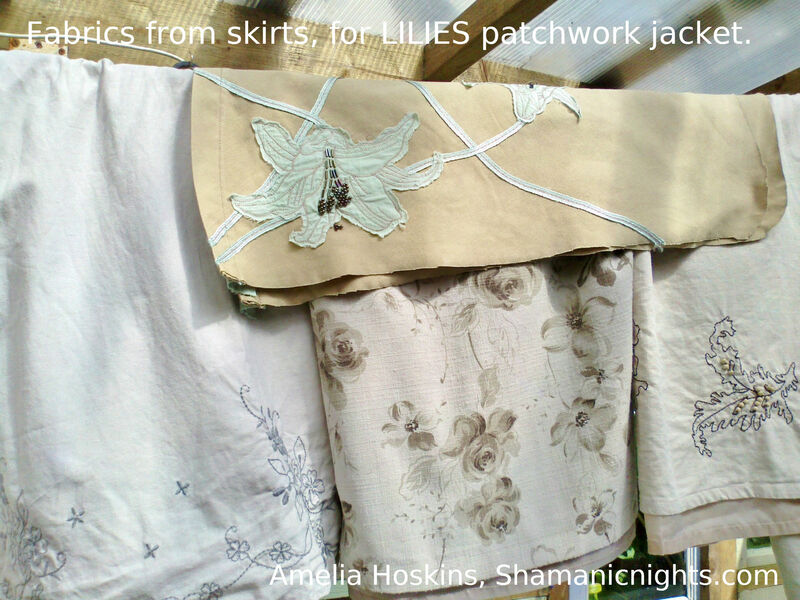 Shamanic Nights uses fabrics from charity shops, mostly very new and good quality. ‘Stonewashed’ Angles above, uses coffee/white dress prints, combined with original silk painted panels of angels and plants in colours to coordinate with fabrics used in dress, by Amelia Jane Hoskins, owner. Textile waste statistics are alarming; 13 million tons per year in USA. Organisations are growing to help with this problem. High street chain fashion stores rush to produce ever cheaper clothes to compete with so called ‘demand’. But the demand is created by designers and companies who put out seasonal ‘fashion trends’, providing them cheap enough for customers to buy new stuff every season, to be ‘in fashion’ but obviously the main reason is to increase companies’ profits. Many of your clothes are made in sweatshops in far away lands, where labour is cheap. People are finding labels from makers, as cries for help, in their garments. Slow fashion entrepreneurs and companies wish to change the unsustainable fast fashion model created since the industrial revolution. Their main criteria is to use ethical fabrics and/or small scale production; and to provide fair wages for garment makers. Some designers are choosing to use ecologically produced textiles, some choosing to use pre-worn clothes and discarded textiles to remake into new originals for the discerning ethical buyer. Ecologically minded consumers and fashion businesses support the development of sustainable fabric production and sustainable garment manufacture. Rather than relying on mass production, with associated use of cheap labour and possibly poor manufacturing quality guidelines. Ecologically friendly fibres such as organic cotton, linen, hemp, bamboo, grown without pesticides. Expensive pesticides leach into water systems causing health problems. Textile production is the second biggest contributor to water pollution globally. 20% of global industrial water pollution comes from treatment and dyeing of textiles. My personal philosophy is that there is already enough fabric in the world! Rather than buying new fabric, I’m personally committed to finding the best second hand garments to cut up, to recycle the best unworn fabric and combine in new ways. The result is a tailor made, freshly designed, totally original and new garment. Textiles produced in small quantities by artisans in small scale village communities, provide rarer originality of fabrics to be treasured by end customers. Natural dyes may be used. Collections may be limited. ‘FAIRTRADE’ cotton is available. Wages must be fare. We must value our work in the new paradigm – unique and sustainable is best, and probably more expensive, rather than falling in line with the old paradigm, where cheapest is better despite the cost to the environment and peoples’ lives. ‘TO DIE FOR ‘- Is Fashion wearing Out the world’? by Lucy Siegle. ‘SHAPING SUSTAINABLE FASHION‘ Changing the way we make and use clothes, edited by Alison Gwilt and Tina Rissanan, pub. Earthscan. Shape is cut for fitted bodice front and back with bat-wing (kimono – like) sleeves extending from shoulders to high waist. Sleeves have cuffs which will turn back at the seam for tasking. Charity shop finds to match existing purple fabrics. The shiny dress will become lining. When cutting up garments for patchwork, cut up along the sides of all seams. Sometimes cotton and linen seams can be ripped undone, and more fabric saved. Overall, unpicking is not worth the time it takes. 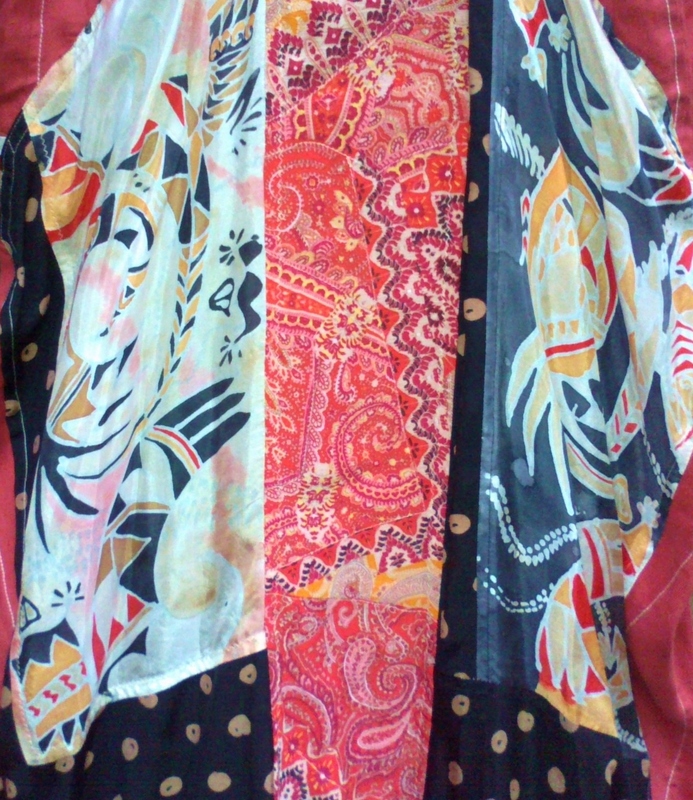 Sometimes there is fabric strain near darts or side seams as there were in this blouse. In such case, don’t undo the seam where stitches have pulled. This blouse had strain around the front dart seams. Due to inherent weakness in the loose weave, this fabric will be quilt-machined onto a thin cotton backing, to ensure it stays firm. Many parts of a garment can be recycled into a different new garment, such as this lace-styled neck. It won’t be included in the kimono, but it will form the start of another dress, likely to be with navy, if only the lace is used, or navy and pink if the print is kept. This top is from a stretch cotton fabric, so will be quilt machined onto a cotton, for firmness, to be similar in weight to the linen and taffeta. If used only in its stretch state, it may cause a slight ‘baggyness’ in parts of the patchwork. Cutting of patchwork pieces to follow soon ………. Swedish Recycle Shopping Centre – the world’s first. Rude Record has found this great news! Recycling Shopping Mall provides a NEW ENTICING INTERFACE: better than dump-off-your-stuff at the city tip – have it recycled properly. As the original writer describes – city dumps with a circle road to piles of stuff – aren’t easily in a position to encourage recycling. Furniture and clothes are the obvious ones. Even half empty tins of paint are useful for something. Unfortunately there are still folks who will only buy ‘new’ and a place like this one in Sweden could make recycling the ‘norm’, rather than something to be frowned upon. It is the WAY FORWARD to the CIRCULAR ECONOMY. Rude Record’s local Melborne council are creating more landfill !!!! Oh dear. There is very little that cannot be recycled! Even broken furniture could be wood chips for garden earth cover and paths. ALL plastic should be recycled. Two similar patchwork dresses inspired by using two halves of a bright cerise pink acrylic wool scarf with stretchy structure for bust fit. Purple silk, taffeta, and lace combine with a legging print to create an exciting party colour combination. Shorter version with black wooden buttons, thin straps and an additional patchwork hem frill in purple silk and multi-toned silk patchwork and frill. Making details below. To buy ‘Cherrie Fluzzie B‘ please email ameliajhoskins@gmail.com – there are two slightly different ones available. Chinese buttons utilize holes already in the acrylic wool. identifies easily as the buttonhole. Longer version with toning cerise pink buttons and wider shoulder straps. leggings are the fabric inspirations to go with the frivolous wool tops. Zig-zag machining holds down inside seams. and bottom edges, they build up into a semi circle. Patchwork semi-circle folded in two, back view. than needed to gather onto woollen top. 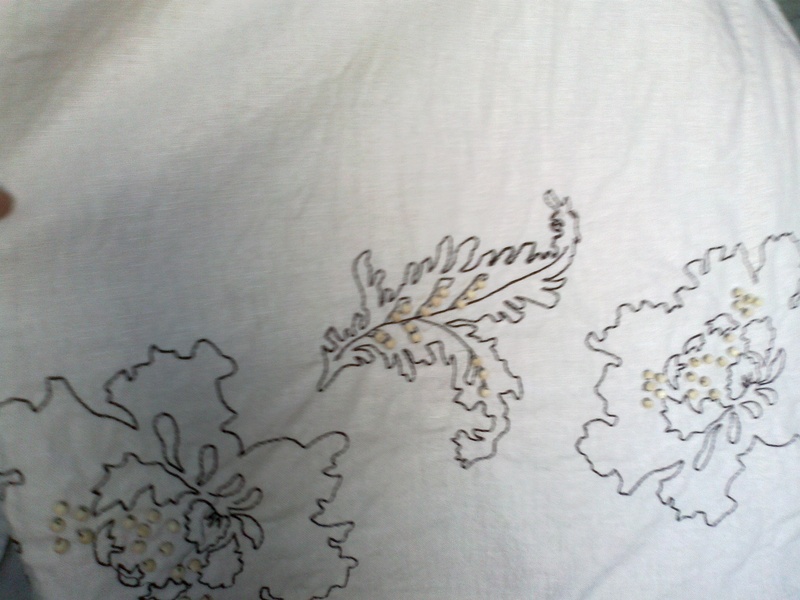 Bottom frill pinned to dress hem, before zig-zagging on. Frill hem will also be zig-zagged. Frill hem pinned, tack gathered, prior to zig-zagging. Leggings cut into 8 patches, use 4 or 8 per dress. (2 short upper, 2 longer lower in skirt section). Front side patchworks pinned to check colour placements. Silk fabric behind crimson lace patches. to avoid bulk on all corners. Patchworks machined - skirt section. hand stitches: cross-stitch done as back-stitch. accurate close up instructions of stretch stitch. 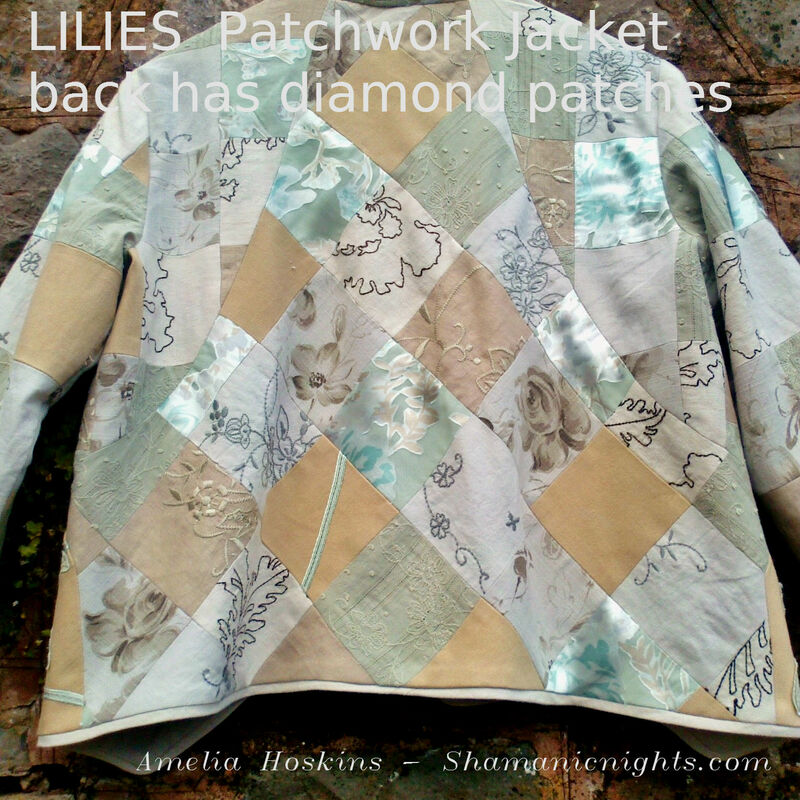 This patchwork jacket was commissioned by 99yr old Beth, a friend of my sister’s in Dorset. She likes something different. Having lived in China, the average high street shop doesn’t attract her. 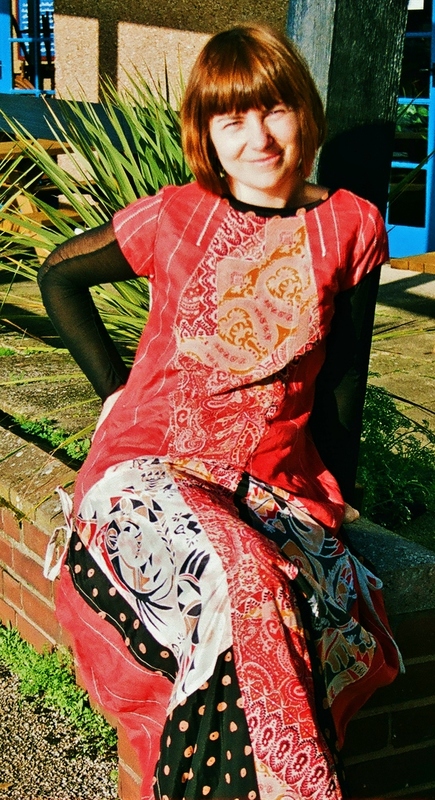 Clothes I make are well received by women who want something unique and original, rather than from high street chain stores; also for women who appreciate the craft of creative patchwork, resulting in the creation of a new fabric. I chose the fabrics myself for the jacket, having met Beth just once. The item was to be for a wedding, so I wanted it to be light and classic, but to still have some interesting elements. 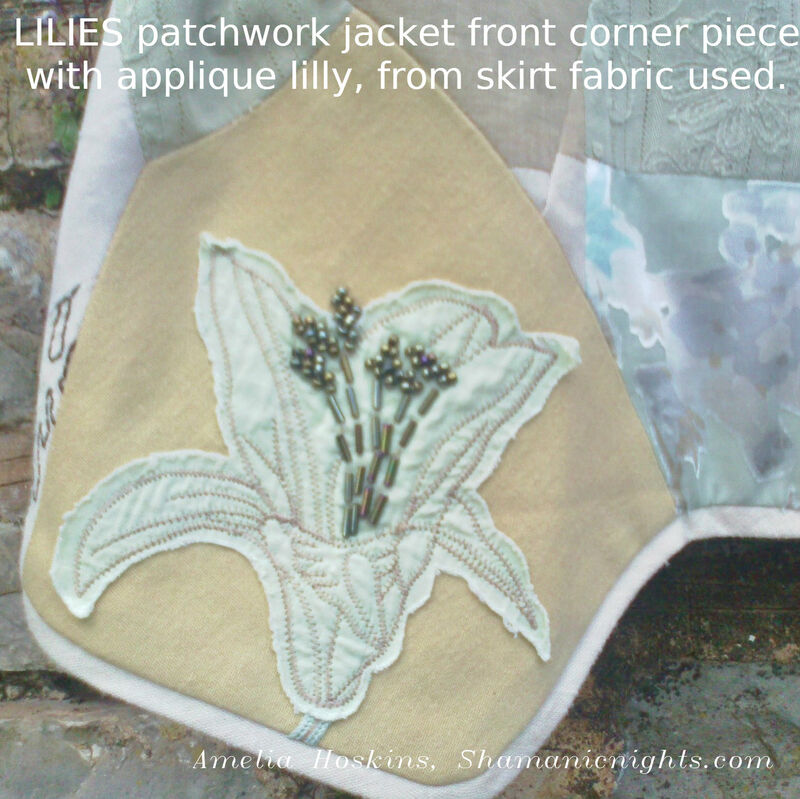 The first fabric I found was the beige skirt with eau de nil applique feature of lilies. I decided this was perfect for the jacket theme. Fabrics I used were linen and linen-mix skirts from charity shops. Quite a lot of fabric is needed for patchworks; its best to have at least 5 different ones. When I cut the patches out and laid out together, I decided there needed to be a highlight colour to accent over and above the all-beige overall look. 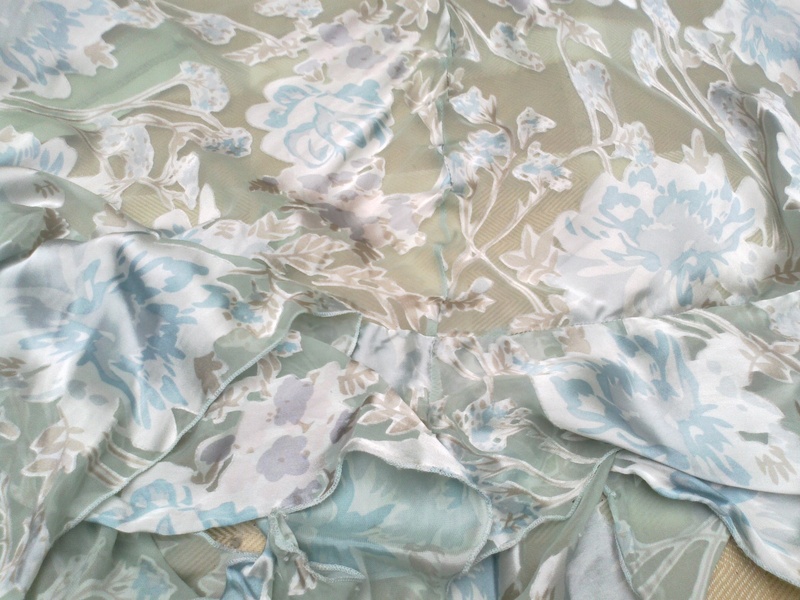 I rushed to the shops, and was lucky to see the pale green and pale blue devore skirt with floral print in shiny synthetic satin in the first charity shop I looked in; it seemed a tad shockingly bling, but knew once it was in isolated patches, it would merely enhance the overall arrangement. As soon as I added in the new patches, I knew I would work. For this jacket, I chose skirts with embroidery so I could use the embroidered areas for patches. Cream linen skirt with brown embroidery. From two embroidered skirts there was enough embroidered area, to give some decoration on every patch in the jacket. I had seen Beth had some embroidered clothes and so guessed she would like it. The lining was a bonus find, another skirt, viscose type, having just the right colours of taupe background with eau de nil green in the woven roses, which ideally complimented the classic beige, cream and light green of all the patches. Cost of fabrics was £42 plus £5 for a synthetic jacket which I just had to get, as it had the shell buttons in shiny light beige with a hint of green, perfectly matching the jacket colours. A touch of shine for a jacket to be worn at a wedding I thought. Due to the centre pattern piece of paper pattern being placed on the bias of the cloth grain/weave, the square patches become diamonds. Bound buttonholes with two different fabrics and the shell buttons. HOPI DANCE. Back view. Cream cotton, black spotted viscose panels. Dress tapers to ankles. 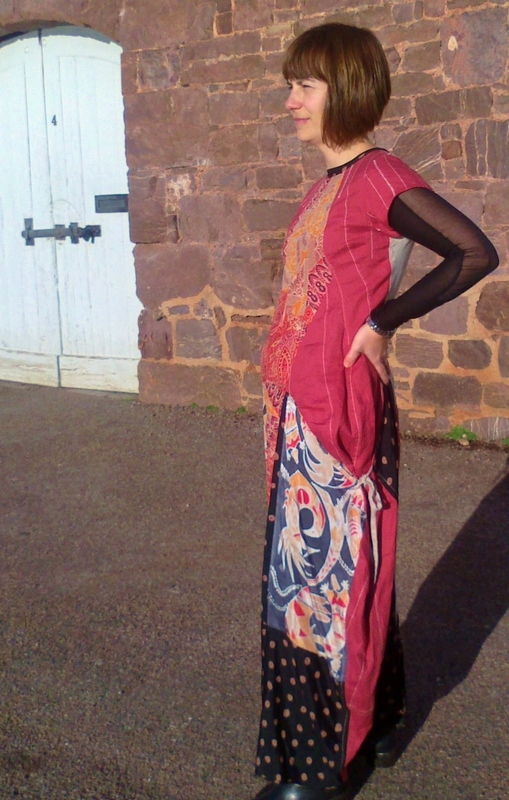 To buy ‘Red Hopi Dance‘ dress, please contact ameliajhoskins@gmail.com or ameliajanedesigns@icloud.com – I have the VOGUE pattern to make a different colour-way. Silk painted panels: Close up of white and black background silk panels of ‘Hopi Bird’ design by Amelia, maker of Shamanic Nights clothes. My inspiration for the designs on silk were taken from images on Native American pottery. The bird designs had been painted around the pots, making the design full circular; I kept many attributes of the circular designs when putting into 2D. Colours combine in this case, to compliment the dress colours. ‘Red HOPI DANCE’ Red Linen with hip ties to adjust at hips for fuller sizes. Pattern used Vogue1234 suitable for knits and so cuts small. I had to add 1.5 inch side inserts under the arms and sleeves to give better fit for 34-36 inch bust. Welcome to the Shamanic Nights BLOG. 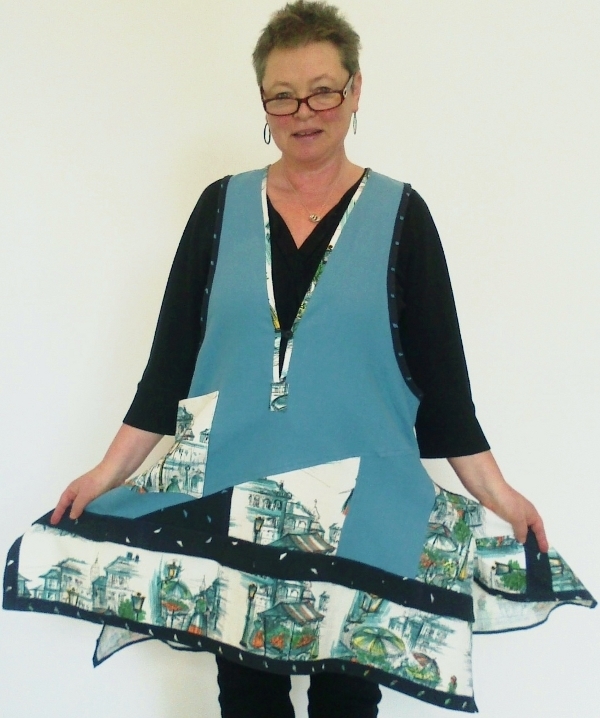 My Mission: To make beautiful casual and luxurious clothes and quilts from recycled fabrics. Stop Landfills. Stop Water Pollution. Stop ‘Made in China’. Working Ethos. Fast fashion has encouraged the spendthrift and waste of textile materials. So many cast-offs! I’ve noticed year on year, the plethora of higher quality fabrics donated to the ubiquitous high street charity shops. Clothes from quality brand names or clothes hardly worn at all, make it essential that the best quality dresses, skirts and T-Shirts be given an extended life. Linens are wonderful to work with: one pair of trousers provides large pieces, as does a flared skirt. Dresses and blouses provide prints and lace. I choose good quality cotton, viscose and silk mostly, for summer dresses: with just a little polyester if a print inspires me, and for most linings. There has been a ground swell of interest in organic cotton; grown without pesticide use, leaving no watercourse contamination. Fertilizers are expensive for farmers in poorer countries, making crops less profitable. The Aral Sea has dried up due to the over use of its water for Uzbekistan cotton growing. Whilst organic cotton is all the rage, cotton itself requires so much water to grow and process, that in the long run it’s not sustainable. It takes 8,500 litres to make enough cotton for a pair of jeans. This is clearly unsustainable, even immoral, when many areas of the world suffer drought. Hemp is the next ‘cotton’. FABRICS from high street store fashions have an incredibly long shelf life, but are sometimes discarded after one season’s wear or if the garment no longer fits. Even household fabrics are renewed more often than years ago. These fabrics and clothes are still here. Piling up in landfills. Rather than throwing away, we need to recycle all textiles as much as possible. For this reason I believe more businesses will take on this challenge; to produce textile products that customers will want just as much as they want to buy new textiles. One of the best things everyone can do is to stop buying more new stuff. Take a fresh look at what we already have. Look in your wardrobe; if you don’t wear something, but love the fabric, cut it up and make something new; add another recycled fabric to it. I take commissions using your fabrics or I will research for a specific colourway or themed garments from the charity shops. ‘The True cost of Cotton’ shows children working in the cotton fields. Links to ethical fashion concerns will be added progressively…..
‘Roundup’ Pesticide ignorantly advertised on Twitter by DEFRA Minister.